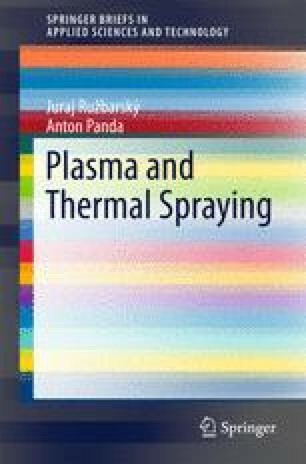 Suitable powder for plasma spraying should possess good flow properties, should easily flow in plasma jet; the powder particles should be of spherical or similar shape and should dispose of identical dimensions defined within the range of the lower limit. In powder spraying with particles of diverse dimension the fine fractions are overheated or evaporated and coarse-grained particles dot not get heated. Important role is played by the orifice of powder feed into plasma jet. The highest effectiveness of powder heating is achieved during its feeding into the centre of the arc burning between cathode and anode in the torch. Such alternative is complicated as to structure.